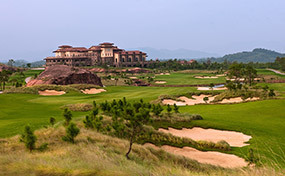 Designed by American Rick Jacobson, the Moon Course at the Lion Lake Country Club is part of a 27-hole resort and residential development an hour northwest of Guangzhou. 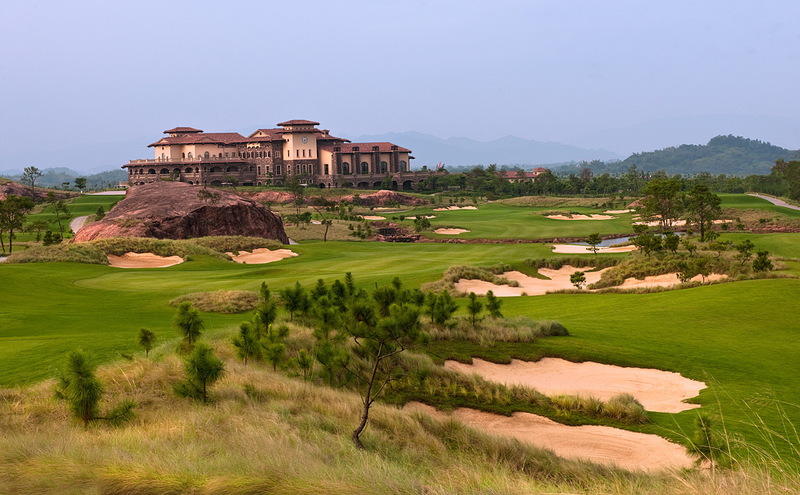 Located within the Pearl River Delta region of southern China, the project actually occupies part of an existing golf course site, which was apparently designed by Larry Nelson sometime in the 1990s. 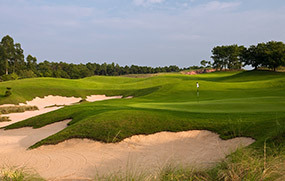 The Nelson course was purchased by a development company in 2006, who engaged Jacobson to transform what was a poor golf course into something more substantial. 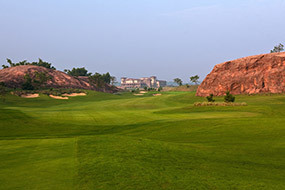 Described by Jacobson as ‘an unrefined quasi-inland links’, the Moon Course is unique for the fact that it’s the only layout in golf to play through World Heritage listed Danxia landforms. Said to be shaped from red sandstone and characterize by steep cliffs, these landforms are unique to this part of China and abundant at Lion Lake. 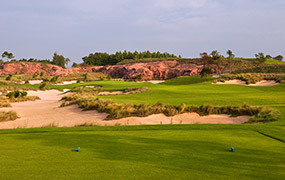 Jacobson did well to incorporate so many of the red rocky cliffs into his golf, with a number of holes playing right through the structures and at least a dozen greens either abutting the cliffs or framed by their red dirt. 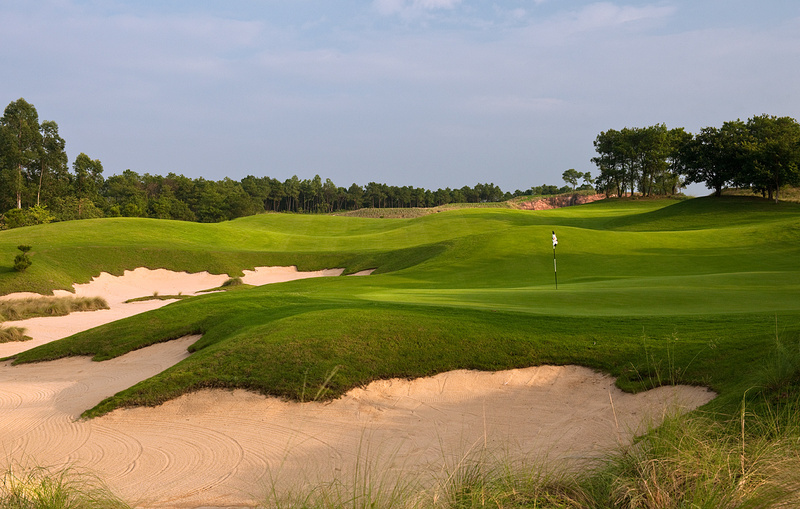 Aside from these rock outcroppings, the other distinctive features on display at the Moon Course are the jagged bunker edges and the uniform use of a South African lovegrass as ground cover. Tussocks of this dense pasture grass are even used in the faces of the bunkers, to create an even more rugged hazard and give the golf course a pleasant old-school feel. Unfortunately this old-school feel comes at a cost, as this is an incredibly penal test and unquestionably one of China’s most difficult courses, something one suspects the owners here are proud of. 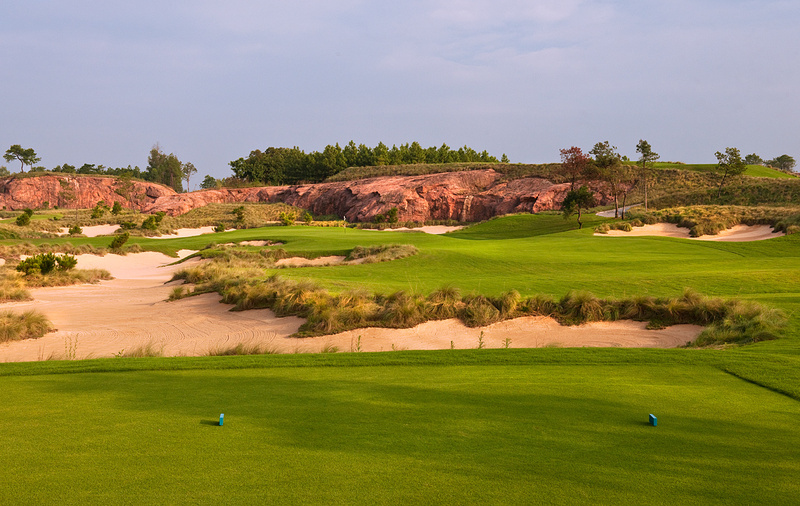 Beyond excessive difficulty in places, the other concerns we have with the Moon Course at Lion Lake are the use of split landing areas, or heroic bunker carries that seem to work reasonably well for good players but rarely tempt average hitters to stretch outside their comfort zone. Also the greens are small, but often the contours quite extreme. Many have been softened since opening, but there remain a few targets with sharp breaks that are both uncomfortable to look at and unduly testing to play. That said, visually the Moon Course is striking and better holes, where the green sites are more effectively framed by the dusty red rock, are quite good. Prime examples include par threes like the 6th, 9th and 16th. Of the longer holes, highlights include the left-bending par four 11th, which turns around a lake toward a green progressively easier to hit the more aggressively you play from the tee. The 13th and 18th are also strong two-shotters, the 18th a big, brawny test of power and the 13th a tighter, more intimate test of precision to one of the smallest, and most dangerous, greens on the course. Pleasingly, Jacobson added plenty of variety to the Moon Course and was unafraid to mix up lengths and create genuine risk/reward options. The best example comes at the 17th, a simple driveable par four from an elevated tee to a push-up green bunkered heavily on the right and squeezed on the left by a rock wall. There are numerous ways to play this hole, but quite properly the designer has rewarded those able to hit their tee shot accurately down the tighter left-hand side. Wedged between a strong par three and a long, dangerous par four this clever little hole adds further to the fun and appeal of the golf course and glues together a terrific closing stretch.